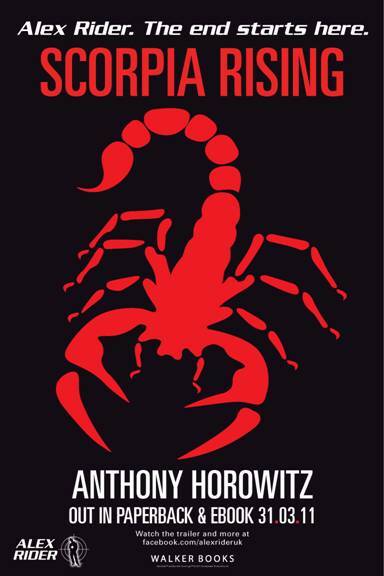 “Explosive, thrilling, action-packed” is just one of the many positive praises to Anthony Horowitz latest title in the Alex Rider series, the last book, Scorpia Rising. With its deadly cover, this book sets down an amazing achievement of being the best of the best Horowitz has to offer. Do you like it when the story is about secret services? When betrayal is more than a word? When there is no James Bond, but surprisingly, it’s all about a 15-year old? Good news: Scorpia Rising has got it all. It all starts with the arrival of one of the world’s most wanted criminals, Zeljan Kurst, the head of Scorpia, in the British Museum. Scorpia is a terrorist organization which has been defeated twice in the past by Alex Rider who was working for MI6. Scorpia’s plan this time includes asking the British Government to hand them the Egin Marbles, capturing Alex for trade and killing American Secretary of State so Alex can be framed for her murder. Genius plan. Or perhaps so it seems to be. It’s up to Alex to save the day, will he succeed? Scorpia Rising is a real pleasure to read. Horowitz takes you through every bit of detail in the story: from the weapon types used and the various location settings. Into a world filled with secret services, he portrays Rider whose spy journey comes to an end. His character has been developed very well – clear to follow. And I love the style this book has been written in. You experience difference points of views. So it is not a question what the plan is, but if the protagonist will survive it. Cool storytelling – Horowitz is the David Baldacci for teens.